Please join us for the next PTSO meeting on Tuesday, February 12th at 7:00 p.m. in the Woodson library. Come meet Dr. Hewan our new Assistant Principal. He oversees the 10th graders, World Languages and Fine and Performing Arts. If you missed Angst at Woodson, watch this important documentary at Fairfax High School on February 20th at 6:30 p.m. This documentary, produced by IndieFlix, is for all parents and guardians of students in grades K-12 and students over the age of 13. Thursday, February 14th - A Woodson fan favorite, Milk & Cookies is a fun Woodson tradition to celebrate our students with milk and cookies and show them positive community support. We needs lots of help from parents to make this event happen. Please visit the SignUp Genius to sign-up to bring cookies and/or to help us pass out cookies at school dismissal. We need around 300 dozen to make sure we have enough cookies for all, so please donate generously! The PTSO donates the milk for this event. For any questions, please email: WTWmilkncookies@gmail.com. The Student Directories will soon be going to the printer. We will distribute the directories to PTSO members as soon as they are available. Stay tuned for more details. Wednesday, 2/6/19, 7:30 p.m. Chorus Booster Meeting. College 101 is an opportunity to learn more about the college admissions process and meet the staff at Woodson who will guide your child along this process. This year's College 101 night is on Wednesday, February 6th (snow date Wednesday, February 13th) at 7:00 p.m. in the Auditorium. Current sophomore families are encouraged to attend even though this process may seem far away. If you have any questions, please contact Kathleen Ishii, Career Center Specialist at kaishii@fcps.edu. Seniors - please plan to attend the first student planning meeting on Wed., Feb.6 at 3:05 p.m. in Room C123. Planned by seniors and coordinated by the PTSO, Baccalaureate is an interfaith, inclusive service to celebrate and honor the Senior Class. Seniors from all faith backgrounds are needed. Parents-please ask your student if they would consider assisting in the planning of this memorable senior class event. The student committee will select the theme, make suggestions for speakers and musical ensembles, and other tasks. Baccalaureate will be held at Woodson on Sunday, June 2nd. For more information contact Betsy Miles at milesfamilylj@aol.com or 703-975-6783. The Winter Dance is scheduled for Saturday, February 9th. The theme is 80’s Sadies, however everyone is encouraged to attend, with or without a date. Tickets for the dance are on sale through Friday, February 8th during lunches and are $10 each. No tickets will be sold at the door. Proceeds from the dance benefit the Woodson Buddies and Woodson's Relay for Life. Woodson's For the Culture Club will be hosting the second annual International Night on Friday, February 22nd. This night is dedicated to celebrating the diverse backgrounds and culture of all Woodson students and family members. We encourage parents to become involved in the night by providing ethnic food for the potluck. Other opportunities for participation include performing traditional dance or song, or wearing traditional attire in the fashion show. We would love for the Cavalier community to be more involved in this event as it promotes cultural appreciation, acceptance and an opportunity to learn more about the world around us. Finally, if any senior students are in need of volunteer hours, the Culture Club's sponsors Mrs. Adams and Ms. Black would provide service hours for the time spent in making decorations after school. If there are any questions feel free to contact us at wtwforthecultureclub@gmail.com. Buy a Brick and Make a Lasting Mark for your Student! The brick courtyard in front of the school, between the main entrance and the auditorium, still has plenty of room for bricks for you to remember your special student(s). Engraved bricks are intermixed with regular paver bricks. Individual bricks cost: $100. The Brick Order form is located on the Woodson PTSO website, scroll down to the engraved brick section. Support the Class of 2020 by purchasing a white long sleeve t-shirt, perfect for the winter sports season. You can buy a shirt on visiting myschoolbucks.com for $20. Shirts can be picked up in F105 anytime. Contact Stephanie Pollack (sepollack@fcps.edu) or Kate Wright (kwright@fcps.edu) with questions. FCPS has created a student-focused webpage that provides information about vaping risks, resources, and videos featuring FCPS students. FCPS’ Student Rights and Responsibilities (SR&R) document was updated in September 2018 to include vaping as a prohibited activity. Students found in possession of or using vape products on school grounds will participate in an FCPS intervention program and may receive disciplinary consequences. Students may face additional sanctions if they participate in a sport or activity where the Virginia High School League (VHSL) participation agreement is in place. We encourage all parents to become better informed about this subject and to discuss the issue with your students, as appropriate. Get started with these tips from the Surgeon General. 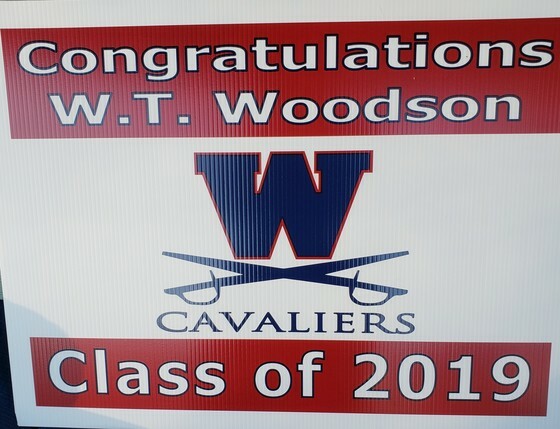 Don’t forget your 2019 Woodson Grad Lawn Sign! Contact merifarling@hotmail.com to get yours now! Only $20 and all funds from the sale of these signs supports the Cav Cruise All Night Grad Party! Woodson’s Student Services Department is in search of parent volunteers for this year’s AP testing. This is another great opportunity to volunteer during the school day! Training will be provided. AP exams will take place from May 6th – May 17th. There are two test sessions, one in the morning and one in the afternoon. Morning test sessions require proctors to be present from 7:45 a.m.-11:45 a.m. (approximately). Afternoon test sessions require proctors to be present from 11:30 a.m.-3:30 p.m. (approximately). Please contact Kathleen Guinee, Assessment Coach, at kpguinee@fcps.edu or 703-503-4805 if you are able to volunteer to proctor. As always, we greatly appreciate the support from our PTSO! Thank you! A coach or parent representative from each sports team is invited to submit weekly highlights to share with the school community. Please keep entries under 150 words and submit each Saturday by noon to nancylparks@gmail.com. The weather wreaked havoc with the Patriot District schedule this past week. The Cavs managed to get one game in, losing another nail-biter at first-place West Springfield, 32-31 on January 31. A furious 4th quarter Woodson rally came up just short. Eunice Yoon once again rained threes to lead the Cavs with 9 points. Steady Maggie McGuire added 7, Abby Pesansky 6, Natasha Pacheco 4, Allie Maahs 3, and Sarah Wilson scored 2 in her return. The Cavs conclude their regular season with home games on Monday, February 4 against Robinson and Friday, February 8 against Fairfax (5:45 start as part of a Girls-Boys Varsity Doubleheader). The Monday game will also be Senior Night as Natasha Pacheco, Rachel Shurberg, Sophie Grammen, Sabrine Hussein, and Abby “Kobe” Schultz are celebrated prior to the game. Festivities begin at 7:15 PM. Congratulations to Payton Andrews, Luke Hartley, and Carson Hoffman on being selected to the High School Ice Hockey All Stars. Congratulations also to Brett Morrow and Danny Morgan for being selected as Alternate All Star Players. These players were selected by their coaches for making great contributions to the Woodson Ice Hockey team this season. Great job! Join us this Friday evening, Feb. 8 at 5:15 pm for Senior Night and our last regular-season game. We play at the Mount Vernon Ice Rink in Alexandria. Parents and athletes are invited to join us on Thursday, February 7th in Cafeteria B from 7 - 9 pm to learn about rowing and how to prepare your athlete for on-the-water practices and the upcoming regatta season. The registration deadline to join the crew team for Spring 2019 is Saturday, February 16th. All registration requirements must be met prior to that date and can be found on our website http://www.wtwcrew.org/home/registration. Thank you for your generosity! The PTSO food pantry is now fully stocked. We appreciate it! No more donations are needed until further notice. The pantry is for distribution to students by school counselors, clinicians and administrators only.